I recently built up David's Tricopter v3 with a kk2.1.5 flashed with steveis's latest 1.9 s1 firmware. My transmitter is an OrangeRx t-six with a orx dsm2 receiver. I have calibrated my esc's and the acc sensor, and in the receiver test all of the values are at zero and go up to ±100 as they should. 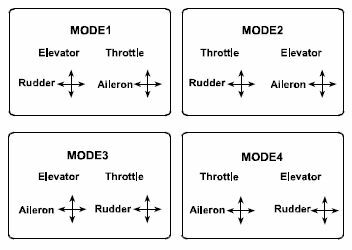 Throttle sits happily at zero (idle) when my stick is to the bottom, and both right and left rudder inputs go to 100. I can get to the safe screen, but moving my stick down and to the left or right does absolutely nothing. Also, my tricopter setup has entirely CCW props on it, but my motor layout has the front left prop spinning CW, right prop spinning CCW, and rear prop spinning CW. I'm not sure how to make it so they all spin CCW as they should for me. I think it would be somewhere in the mixer editor, but I've played around there but with no success. I'm willing to dole out any more information as needed and post pictures/videos if need be, it would be great if I could help solving this! The only thing I haven't seen you note is that the airframe is level when you attempt to arm it -- if you hold it/set it down at an angle too far off the calibrated "level", it will ignore the arm command. Not sure what the formal limit is, but it isn't hard to get it close enough. Otherwise, if the screen is flashing any errors (which you probably would have mentioned) that would help to know.
. . . and 1.9s1 isn't the latest version. 1.19s1 is -- for some strange reason, since 1.9 was published it always floated to the top of the list in the Flash Tool. Either way, a fresh reflash has been known to straighten out these kinds of gremlins. As far as prop rotations, so long as the three motors blow down it's not an issue on tri's. The yaw in the tri's mix should only be non-zero in the servo. Hi there, I used to have a kk2.1.5 on my bat bone. I enjoyed the first flights of it but before that the board wouldn't arm like yours, i almost gave up when i spotted that the throttle trim was not all the way to zero. If your throttle trim is not at its lowest it wont arm. But my kk board was using the stock software. Either way, i got rid of mine in the end and bought a naze 32 as in the cold the kk absolutely did not work. Sometimes it wouldnt arm, sometimes it would, others it wouldnt DISarm and others it would. sometime the props wouldnt stop spinning all together. the throttle would not idle when it was next to me with all trims down and so with this it would not disarm. maybe I had a duff FC or I was doing something wrong, either way- my experiences with that FC were not good at all. It was a practical board with the screen just i did not like it. The naze gave a much better feel to the aircraft and my flights were better over all. But try the trim. Make sure it is completely at zero. Hmm, well I updated to the 1.19s1 firmware, and in the receiver test, there's something like an arm status indicator, and no matter where I move the right stick, it stays in safe mode. All of the trims are from 0-100, acc is calibrated, no errors on the safe screen. Any other ideas? Ok . . . how's the "sensor test" screen look? Everything "OK"? Yup, everything says OK on the sensor test. I started to think that quite a while ago. Do you think it's a defective board, or should I keep trying? Also, I emailed the one and only David Windestal about the problem, since it seems pretty unique, but he hasn't gotten back to me yet. All I can say is if you move to naze, the difference you will see and feel in the air is huge. It may take some time to learn cleanflight or to plug the correct plugs into the receiver. But once that is sorted and it is tuned, you will enjoy the experience so much more. To arm the KK2 board you have to move the rudder stick (left stick) all the way to the right. To disarm the board you move the rudder stick all the way to the left. I've got mine set up on mode 2, image below, if yours is the same the following should arm the KK. Check your endpoints, check your trims, check the calibrations all show zero when your left stick is bottom centre and right is dead centre. Move your left stick all the way right and hold it for a few seconds at ZERO throttle. If it helps, I can upload a quick video of how to arm or alternative you could upload on how you try to arm - I know it may sound really basic but if it helps ,it may do the trick. Also, check you've not got any of the sticks reversed on your TrX, maybe you're trying to arm at 100% throttle? That's assuming you're flying in the same TrX mode I am, it's possible you've got your mode set up differently. To arm, you want to be at 0% throttle and you want to rudder all the way right.